Note: A couple nights ago we had the rare privilege to see Safety Last! alongside Buster Keaton’s One Week at the Indianapolis Museum of Art’s Toby Theater, accompanied by the Indianapolis Chamber Orchestra. Watching silent classics as they were originally seen, but with a more competent soundtrack, was phenomenal. Safety Last! is often hailed as Harold Lloyd’s most remarkable achievement, granted the same status in his oeuvre as The General [review here] is for Buster Keaton and City Lights is for Charlie Chaplin. Lloyd’s style in Safety Last! is distinct, containing neither the frenetic action of some of Keaton’s films nor the heartwarming scenes of some of Chaplin’s work. He instead relies on meticulous setups, gags requiring precision planning, and intricately woven physical sequences. Safety Last! revolves around a young man, called the boy (Lloyd), as he attempts to work hard enough to earn the hand of his girl (Mildred Davis) in marriage. He moves to the big city hoping to work his way up the financial ladder while she stays behind in her small hometown. He finds a job at a department store, selling fabric to well-to-do city women. He works hard, eager to prove to his girl that he is successful. He shares a small room with his pal (Bill Strother), but often spends the rent on jewelry for his girl. A problem arises when the girl shows up in the city unexpectedly, thinking that her man is wealthy and successful. This is not the case, sending the boy on a crazy mission to keep his true position a secret while pretending to be an important figure for the department store. He also needs to find a great deal of money, quickly, to marry her and buy her the house she already believes that he owns. He overhears the store manager offering $1000 to anyone who can promote the store in a big way. He quickly takes up the offer, enlisting his pal to climb the outside of the tall building. The news agent does his job and a large crowd gathers, but a meddlesome cop prohibits the pal from performing the stunt, forcing the boy to take it up on his own. 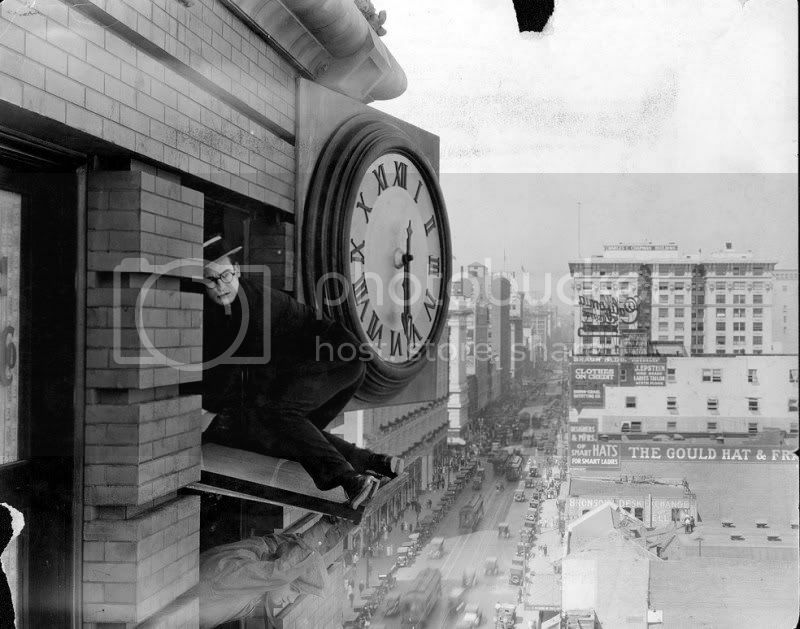 His clamoring to the top of the building yields some of early cinemas most enduring images. Safety Last! is not a constant laugh riot; it instead builds to Lloyd’s most important scenes carefully and meticulously. 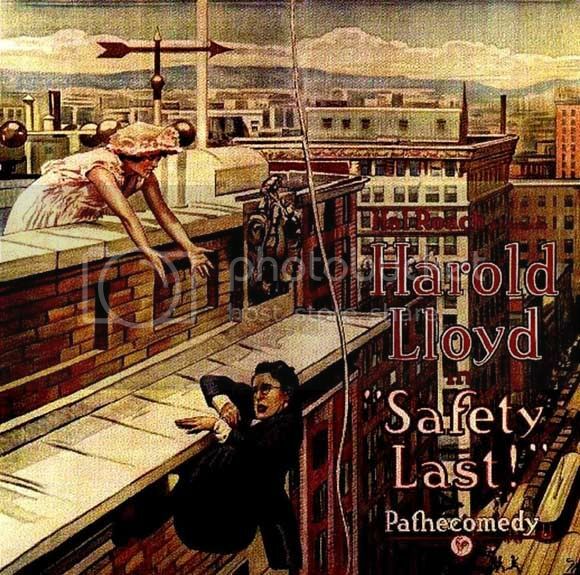 There are only glimpses of his incredible physical prowess before his climb to the top of the building, made more remarkable by the fact that Lloyd had lost a thumb and finger several years earlier in an on-set accident. Even as he crawls up the building he makes the task look as if it is performed by an amateur, and he does it convincingly enough to be all the more impressive. The final scene, which occupies a great deal of the running time, is phenomenal. Note how the editing shifts slowly as the scene builds; at first there are a great deal of reaction shots of the crowd below, but as he attains greater heights the camera only occasionally shifts from Lloyd’s ascent to his pal’s problems with the police. The scene is crafted from editing, careful and perfect, to create the illusion of an immense feat of athleticism. A careful viewer will notice that the background buildings change at one point, indicating that there is no single, actual building that Lloyd climbs. That the scene is so thrilling is a credit to Lloyd and the editing (T.J. Crizer), and the use of clever trick shots should not detract from Lloyd’s feat. 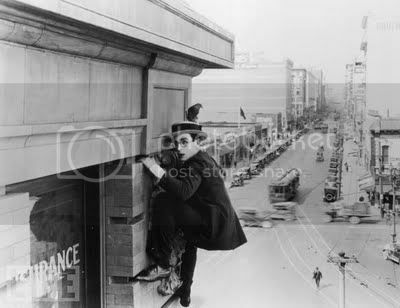 His ability to pull himself up each successive ledge and dance precariously on a small lip of the building, is incredible and daring. Some of the smaller shots are similarly impressive, particularly a sequence showing the point of view of an ambulance barreling down a street crowded with pedestrians, automobiles, and streetcars. The massive crowds involved in some shots, and the ability to make them act as one (especially in a scene where a floorful of women simultaneously duck) is amazing. 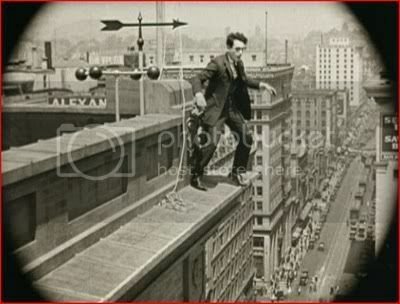 Regardless of your view of silent films, Safety Last! is an impressive and wonderful movie. It may not contain Keaton’s freneticism or Chaplin’s heart, but it earns its stripes via meticulous planning and incredibly complex stunts. Safety Last! is truly a classic of silent cinema, and any opportunity to view it should be grabbed. This entry was posted in 3 pirate flags, 4 stars, Movie Reviews, Movies I Truly Love, Pirate Flag Rating, S, Star Rating on February 28, 2010 by Tim Irwin.